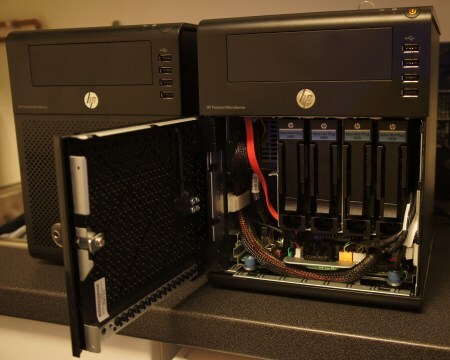 Hewlett-Packards Microserver is great value for money. 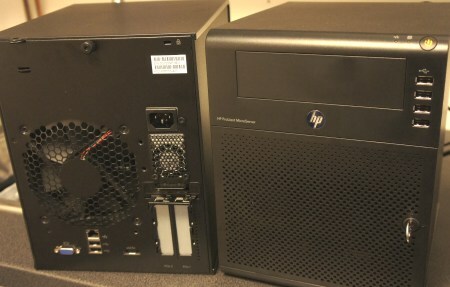 At work we have bought the more expensive rack-mount ProLiants for ten years, and with the microserver I have transitioned to HP for my home server as well. Inexpensive, extensible, low-noise, small and with a slick black finish. Thumbscrews for case and mainboard, lots and lots of spare screws in the back of the front door together with a supplied torx-tool, and neat cable routing. Let’s open it up and have a look. This variant contains the AMD N40L dual-core CPU. The mainboard has two RAM slots for a maximum of 8GB and comes with one 2GB stick. The 4 SATA bays are for 3.5″ drives and connects with a special cable to the mainboard. One 250GB drive is included. The main board slides out just by loosening two thumb-screws. To slide it out further than the picture shows, the cables must be disconnected. All connectors are either fit-one-place-only or color coded so putting it back together is easy. The main specs are easy to find on HPs site or elsewhere, but there are three small features not mentioned. 1) There is one spare SATA connector labeled ODD (Optical Disk Drive). 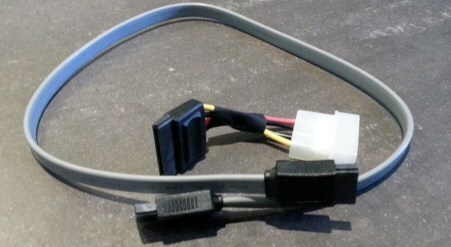 While intended for a DVD drive, in the pictures you can see it used to connect a red cable to a 2.5″ SDD slid in between the optical drive bay and the 4 SATA bays. There is plenty of space for it there. This means the 5.25″ slot for the DVD is still free for whatever you can fit in (although there are no more SATA connectors). To pimp your box this way you will need a standard SATA cable and power converter. 2) While the specs say 6 USB connectors, four in front and two in back, there are actually 7. The last one is on the mainboard just by the ODD connector. In one of the pictures you can see it occupied by an orange usb stick. 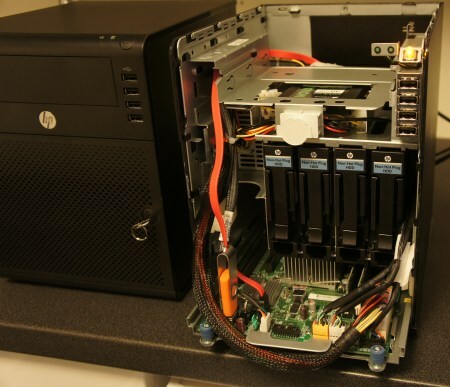 When using the server as a NAS, this could be the boot volume, leaving all SATA bays for storage drives. By default, any usb drive has a high priority in the boot order in the bios. This means that installation is as easy as plug in the os image usb stock and press power. 3) It runs very silent. Extremely silent for a server. It has one big fan on the back, allowing for fewer revolutions and less noise while still moving enough air.